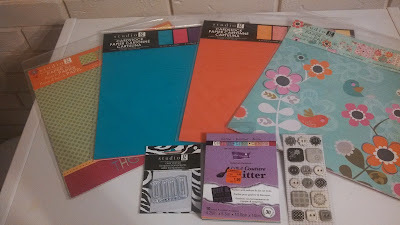 Last week in the craft section Meijer's had a lot of empty space. This week there was still some emptiness. But they did fill some of it with a new craft line. Cute items. I was inspired. Everything that I saw was marked $!. I did grab a few things and a clearance item. YAY!! I will surely be going back to see if there is anything new in those empty spaces. but I scanned it at self scan and it came up $.89. Good deals. Good stuff. Check it out!! !